"The Wind And The Lion"
These photos are from a game we ran at the inaugural Colonial Barracks Convention in New Orleans several years ago (www.sergeants3.com). My friend Nick Zizo and I had been planning to run this game for a very long time. Nick and I had first discussed doing the game at Historicon some 10 or more years ago. It actually came about while smoking cigars and drinking whisky after a long day of gaming in Cocoa Beach Fl where RECON used to be held. We decided who would build what and paint which forces. 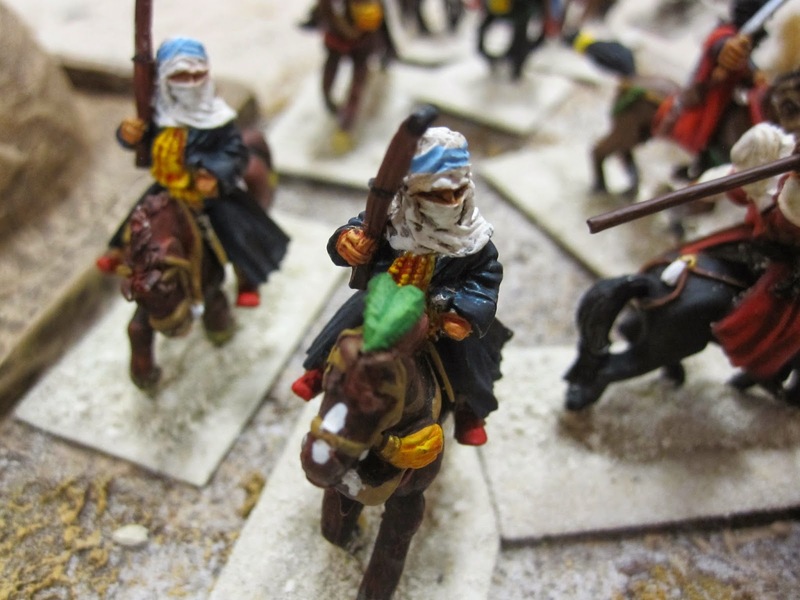 Nick painted the Marines, the Bashaw's guard, the French cavalry and numerous Berber units. He also supplied Mrs. Pedecaris. I provided the German infantry, guns, limbers, and Major Faust, the Raisuli, more Berber units, and I scratch built the custom items that make this iconic battle so easily recognizable. We have used a Foundry sword wielding Baluchi fig for the Raislui for all of our games to date, I hope that in our upcoming game Nick has painted the wonderful Raisuli fig from Gringos 40's! The remainder our our buildings come from every source possible. 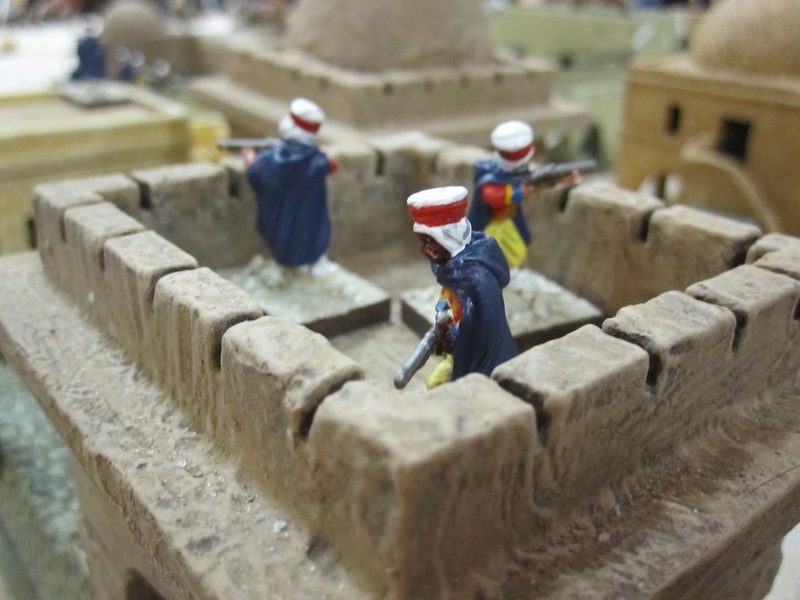 Many are from the great MBA (Miniature Building Authority) 25/28mm desert range. Others come from various internet sources, but the bulk came from a guy on ebay who does wonderful foam card adobe type bldgs. If you look closely at the bldgs in this post and the one to come for the Colonial Barracks game pics you will see slightly different village set ups with bldgs relocated or added because when we ran the game we could not find the game map and used what bldgs we had on hand and what we could draw from our failing memories! The rules we used for all of these games, as well as for all of our various colonial and post colonial actions are the timeless "THE SWORD AND THE FLAME" by Larry Brom. We find this set to be huge fun and perfectly compatible with both convention play for 6-10 players as well as club play with 2-4 players. We have been using this set and its variations since the mid 1980's. The current set is the 20th Anniversary Edition available from (http://sergeants3.com). We have made a few adaptions and changes for larger battles and to speed up play, but have kept the iconic melee stage intact as it adds great tension and Victoria Cross type results. Morocco, 1904, "America wants Pedecaris alive or the Raisuli dead!" President Theodore Roosevelt. The Bashaw's troops stand guard in one of the village towers. These are dismounted Saphi figs from Askari Miniatures (http://www.askari-minis.com). Major Faust stands next to the wool dying merchant, his horse being tethered elsewhere. I made this piece using grocery store bamboo skewers, miniature ship building rope, and craft yarn from Michael's. I also used one of these figs for a gun crew commander. The Berbers advance en-mase, here comes the first wave. Steady boys, pick your targets. The German gunners take aim at the advancing Berbers. There were two such guns in the game, batteries #13 & #17, each with an ammo limber. One FK16 field gun came from Brigade Games German WWI range with an Askari Miniatures limber and the other FK16 gun and limber came from Tiger Miniatures, available from Recreational Conflict in the USA, and the other from (http://www.recreationalconflict.com). The Marines make their move on the Gendarmes Police station and jail house. French cavalry have charged them in the flank. The Marines are from the Old Glory Boxer Rebellion line and the Chasseurs d'Afrique are from the OG French Foreign Legion range. The German gunners have found their mark and ranged in on the advancing horde! Excellent explosions and low stone walls are made by Dwight Jones who sells great custom made terrain at the HMGS South and Rapier conventions in Florida, and at Colonial Barracks in NO. German infantry man the sand bag emplacement around the Gendarmes post, where Major Faust has temporarily taken refuge. 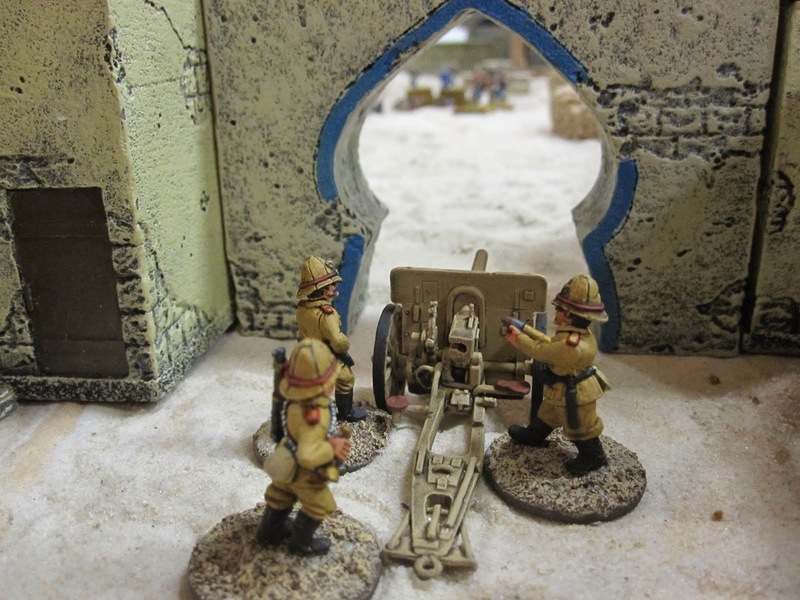 These great 25/28mm pre-painted sand bags were bought from Rudy Nelson at Time Portal Hobbies from an HMGS-South con. They are made by Pegasus Games. The German infantry come from Old Glory in their WWI range and are labeled German Reservists. I will unearth more game pics and possibly some WIP terrain pics for the custom terrain I've made for these games. Nicely done indeed!!! Man, looking at those pics brings back memories of that great game. For more than 2 years now I've wanted to post the pics I took of that battle. Hopefully seeing this will serve as the final drop of inspiration and get me to do it! Meanwhile I'm looking forward to seeing more of your pics! Beautiful work. BTW, do you know the military painting in one of the interior shots of the Wind and Lion movie? Hi Francis X, I'm glad you enjoyed the post. Thank you for the kind words. The game was huge fun to both prep and run! I've run it several times from cons in both Florida and New Orleans.